Gal Kessler Rohs, an LCHS parent and education director for Temple Beth David Religious School, Holocaust survivor Trudie Strobel, LCHS 7/8 Principal Jarrett Gold and Holocaust survivor Leon Prochnik spoke at an LCHS program about Holocaust trauma and tragedy. 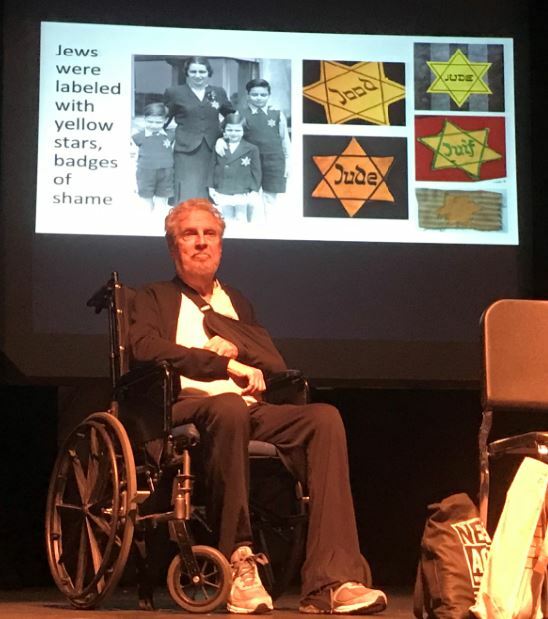 Pleading with their audience not to forget the horrors inflicted by Nazis during the World War II era, two Holocaust survivors recently shared their stories with about 400 people at the La Cañada High School Auditorium, including LCHS 7/8 students. 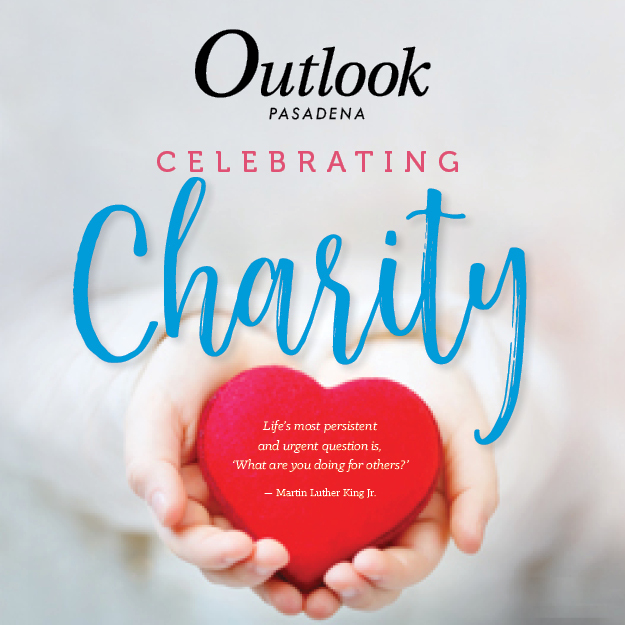 La Crescenta resident Leon Prochnik shed tears frequently as he recalled how his family, which he said owned the second-largest chocolate factory in Poland, escaped from its homeland to safety in Lithuania, then to Japan and Canada. 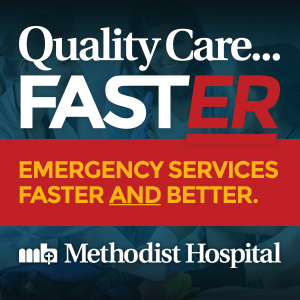 “It was a life-and-death drama,” Prochnik said. “I didn’t know the murder part, because that’s not what my parents talked to me about. My sister knew there was a great danger of that” — of the dangers of Jews being killed at the hands of the Nazis. Trudie Strobel, a resident of San Marino, vividly remembered Nazi soldiers who held rifles and yelled “You dirty Jews” to her, her mother and others while pushing them into a cramped wagon carrying them to a displacement camp. “All I could see were shiny boots and the dogs’ teeth,” said Strobel, who was 5 at the time. “I just lived in fear. As we entered the wagon, it had an odor. They must have swept it, but it was a smelly place. There was no room to sit down. We were not given any water or food. A pail in the corner could hardly be used. Some people got sick and vomited. 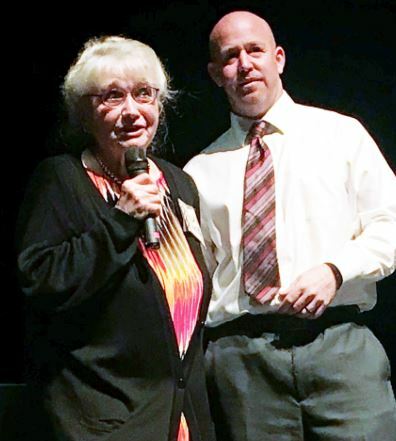 Holocaust survivor Trudie Strobel and La Cañada High School 7/8 Principal Jarrett Gold speak to the audience consisting mostly of 7th-graders. 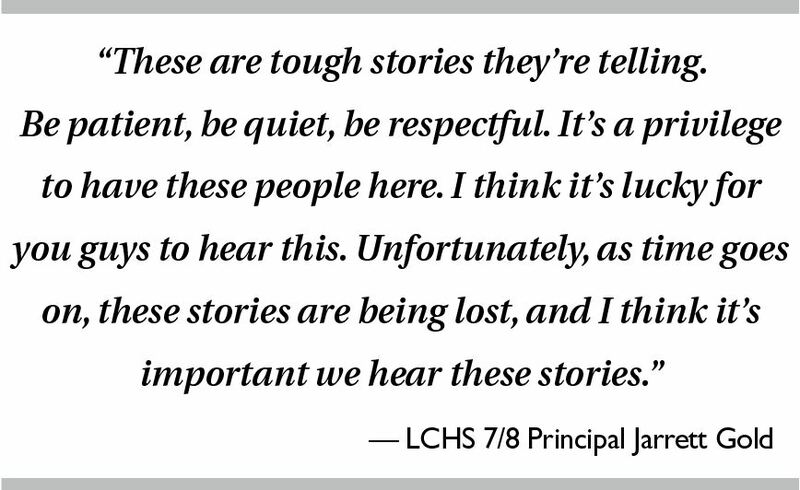 The speakers were part of the program “Beyond Fear, Resilience, Resistance and Bravery: Stories of Trauma and Tragedies Through the Holocaust” held at the LCHS Auditorium. Temple Beth David Religious School offered the program in collaboration with LCHS 7/8. LCHS 7/8 Principal Jarrett Gold said students were getting ready to read “Anne Frank: The Diary of a Young Girl” and this was a valuable opportunity to learn from Holocaust survivors firsthand. Gal Kessler Rohs, an LCHS parent and education director for the temple’s school, had approached Gold about making the event possible. Rohs, who said students had a duty to listen carefully, explained how Adolf Hitler helped start the Nazi Party. He began World War II in Europe by invading Poland and was key to the Holocaust, in which 6 million Jews died. Three students and organizers lighted six candles before the program began. Rohs said being called a threat meant Jews were isolated and eventually put into secluded places, ghettos, where they were denied basic necessities. “They were basically like prisons,” Rohs said. “They were told they were going to these ghettos where they wouldn’t be mocked and threatened anymore, and instead of that would have a wonderful life.” Rohs said those held captive in the ghettos were transported to concentration camps, where they would probably die, or to labor camps to work, like Strobel’s mother. 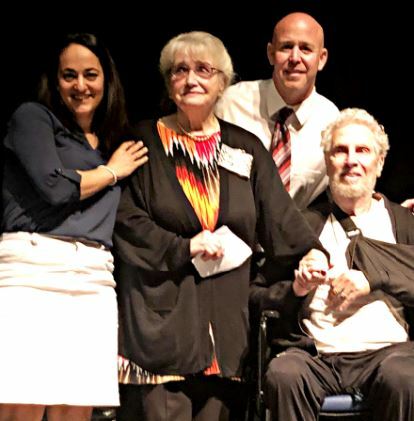 Holocaust survivor Leon Prochnik speaks at “Beyond Fear, Resilience, Resistance and Bravery: Stories of Trauma and Tragedies Through the Holocaust,” a program held recently at the La Cañada High School Auditorium. Prochnik recalled when he and his family were escaping from Poland in a hay cart and they were stopped at a German post. He compared his family’s struggle to reach safety with that of current immigrants seeking to cross into the U.S.
Prochnik asked organizers toward the end of his talk for more time to tell his story and even asked the young audience if they wanted to hear more. Strobel, who warned the audience to beware of white supremacists, told the audience to never forget the Holocaust. 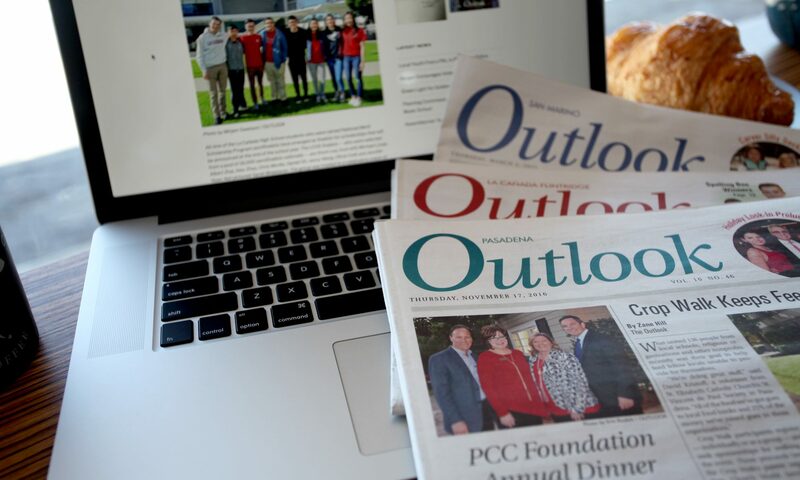 The presentation made a strong impression on some students who spoke with The Outlook. “It was extremely interesting and it was very heartwarming that they were able to escape alive, and these stories need to be passed on,” said Sophia Tripathi, 12, who is in the 7th grade. Nicole Adamian, 12, said the stories from the two survivors were very inspiring.